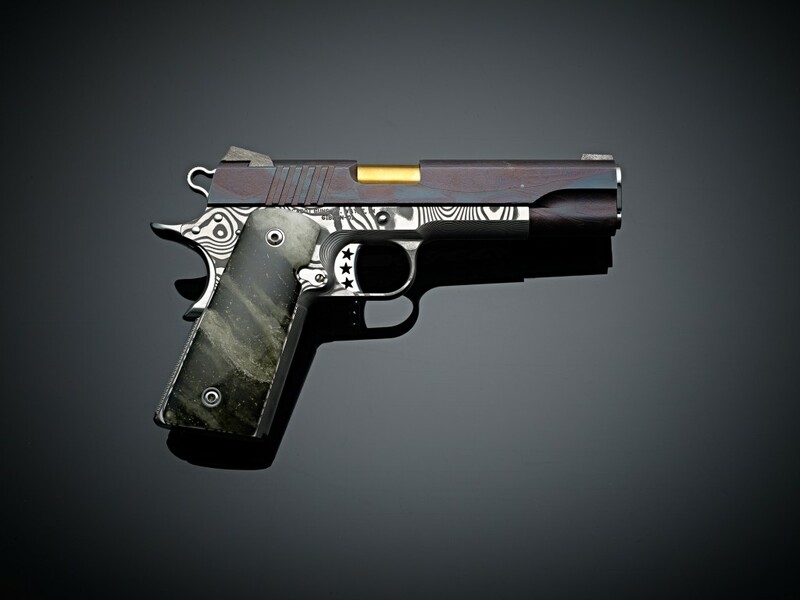 A collision of materials: Gibeon meteorite forged in steel, fine artisan Damascus Steel and a mysterious glass created through a force equivalent to several nuclear explosions induced by an interstellar collision all collide in a journey to make to a 1911 style pistol unlike any seen before, Stellar Fusion. A wall of flame hundreds of feet high traveling at near the speed of sound swept over the sandstone hills of what is now the Great Sand Sea of the Libyan Desert some 30,000,000 years ago. All of the lush green vegetation, animal life and water was instantly vaporized while the rocky soil beneath was fused by the 1,800 degree heat into a layer of green glass. The aftermath of the meteoric air burst seared the earth to such an extent that glassy fragments from this event are found over an area of 6,500 square miles. This glass, now broken by geologic events, transported by rivers and abraded by sand, attracted the attention of some of our earliest ancestors who found this material to be ideal for knapping stone tools and projectile points. The green translucent material also appealed to Egyptian royalty. Tutankhamun was interred with a necklace whose centerpiece was a large scarab carved from the yellow-green glass. Scientists were struck by the uniform nature of the material. Wherever it was found it was the same color and composition, and they puzzled about its origin. As various theories were advocated and disproved, the key to the mystery was found at one location where the glass was banded in layers and contained osmium and iridium in proportions found only in meteorites. One of the rarest of the rare specimens of this banded glass was chosen to make the grips of Stellar Fusion, Cabot’s newest 1911. Only by using the finest diamond impregnated saw blades and abrasives could this glass be worked without overheating it or stressing it to the breaking point. Work on the layered glass with its variable hardnesses required the delicate touch of a surgeon and the courage of a diamond cutter. There was not enough of this very rare material to allow for a second chance. In keeping with the extra-terrestrial theme of the Steller Fusion, pieces of the Gibeon Meteorite were forged into a billet by Master Bladesmith J. Neilson who is well known as a judge on the Forged In Fire TV show. This meteorite, discovered in 1836 in Namibia, is estimated to have had an original weight of 26 metric tons when it entered the Earth’s atmosphere.. Masses of meteoric iron weighing from 200 to 1100 pounds have been recovered from an area of hundreds of square miles. Smaller fragments are still being recovered. This meteorite is notable in that it can be machined, and the front and rear sights are made of these materials with its distinctive Widmanstatten markings and provide a striking accent to the pistol. Damascus steel forged from selected billets arranged to give a wild pattern Damascus was commissioned for the pistol’s frame. 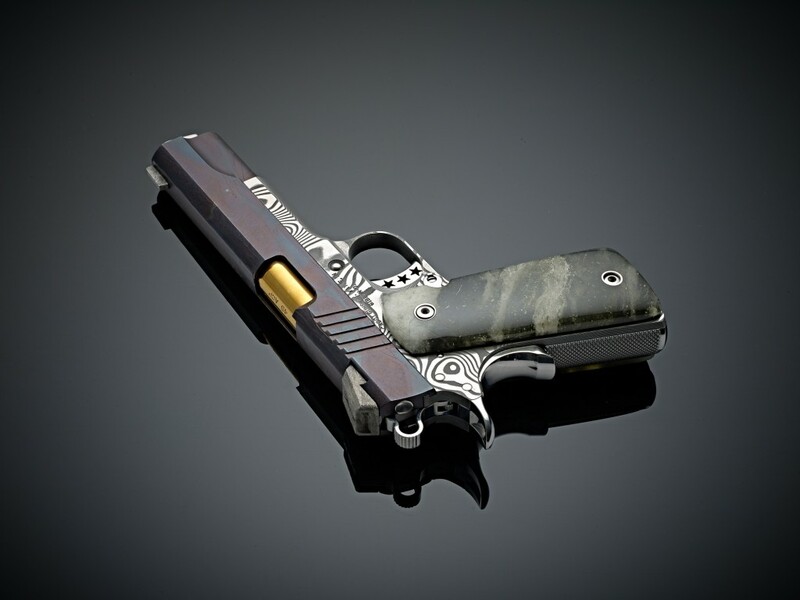 The distinctive zebra-striped frame mated to a meteoric-matrixed slide, topped off with the Widmantatten figured sights enhance the striking banded Libyan glass grips to make the Stellar Fusion one of the world’s most distinctive firearms. 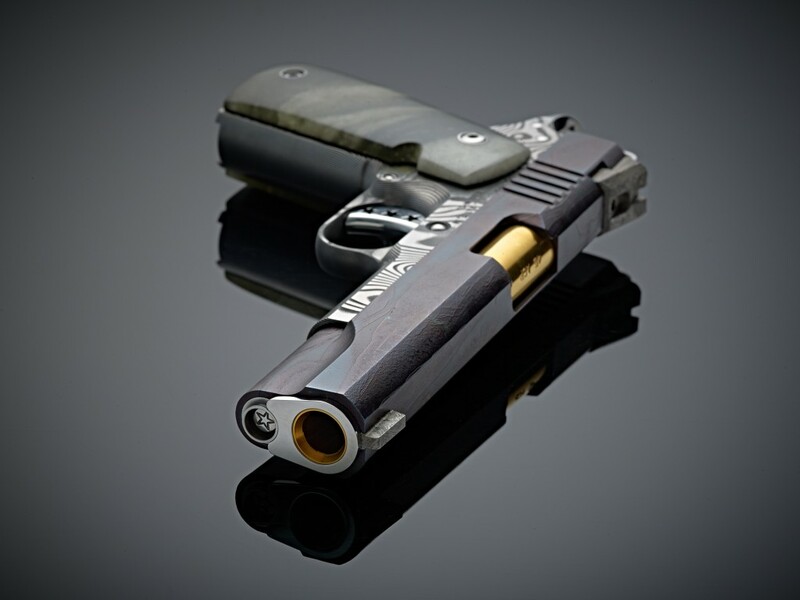 Truly one-of-a-kind, it is fully functional and assembled with the precision components used on Cabot’s competition pistols. The micro-polished components cause the pistol to function flawlessly – just like Cabot’s regular production of match-grade handguns. Although unlikely to be called upon to ever fire a shot, the Stellar Fusion will shoot with the best should the need arise. 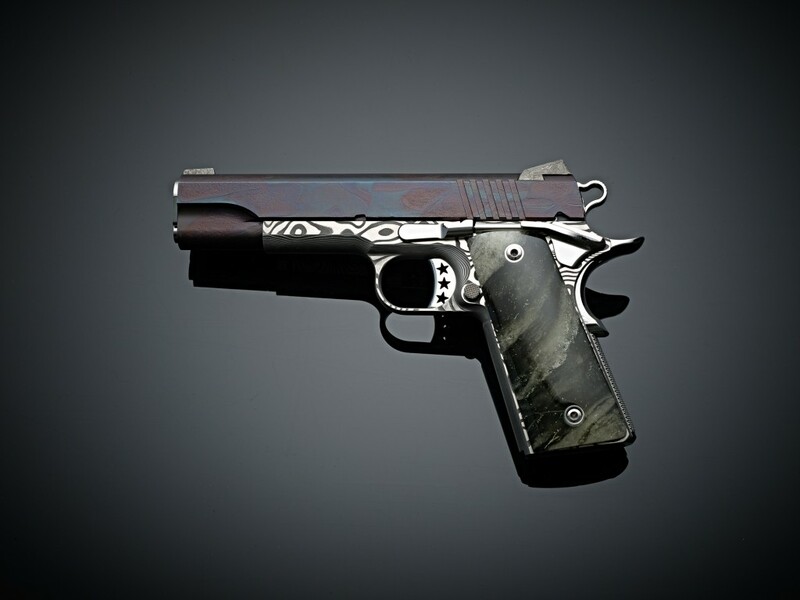 Despite being made of unusual materials and beautifully executed, The Stellar Fusion is, above all else, a Cabot 1911.